It's the last stop of the day for Rural Bookmobile West, snugged up against a curb in a corner of the Ramah Post Office parking lot, where a few customers-to-be wait in their cars protected from looming dark clouds that smell of rain. Inside the bookmobile, manager Wendy Roberts and assistant Toni-Lynn Hart scurry around, turning on the generator, snapping on lights, moving CDs to a low shelf and readying the card catalog _ narrow boxes filled with cards from checked-out books. In a digital age where news comes on cell phones and readers download e-books, three bookmobiles chug along the back roads of New Mexico, bringing a library to people who otherwise live without one. The New Mexico State Library's on-the-road program is unique. "There are no other state-run bookmobile programs that I am aware of," said Michael Swendrowski of Milwaukee, chairman of the subcommittee on bookmobiles for the American Library Association, which last year celebrated 100 years of bookmobiles. Nowadays, most are operated by cities, counties or regions. Ramah, population 407, is the busiest of this three-stop day, which saw the bus-size bookmobile trundling along two-lane blacktops winding through pinon and juniper hills _ an hour's drive or longer from the nearest library building. The door opens and a half-dozen patrons board to return books, then everyone scatters to find something new to read or watch or listen to from the bookmobile's 3,500 to 4,000 titles, CDs, DVDs and magazines. Teacher Phil Snyder has traveled six miles for the 90-minute stop. 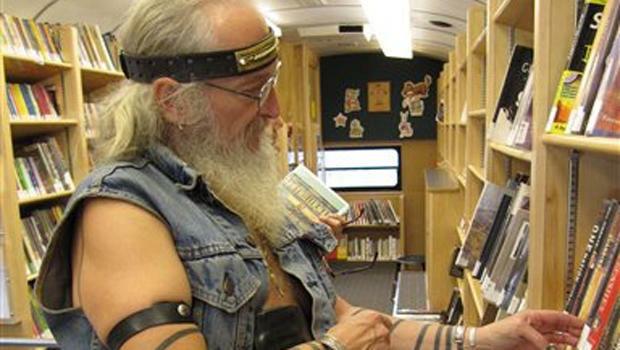 He calls the bookmobile "an important part of the community." Snyder reads mysteries, has learned local history from the mobile library and exclaims: "These ladies got Bill O'Reilly's latest book!" Ten-year-old Christopher Maki sits on the gray carpet floor, thumbing through books. In previous trips, he's checked out ones on reptiles, caring for his turtle and how to make a radio. Today, he's looking for something on origami and "anything that looks good" before checking out books on Frankenstein, dinosaurs and knitting. One woman examines the mystery section for Santa Fe writer Michael McGarrity. "I'm missing 'Hermit's Peak,'" she laments. The title isn't there; the librarians say they'll look for it for next month's trip. When they know a patron's interests _ and that's more often than not _ they'll suggest similar books. "When you talk to people, you find out what they like," Roberts said. "Then you can bring books along that you think they might be interested in. Sometimes they're pleased and sometimes they say, 'No thanks, but thanks for bringing it.'" They greet many customers by name _ "You're only a stranger once," Hart said. Many patrons know each other and offer advice about books. Cindi Andersen of the rural Candy Kitchen area near Pine Hill has come to the bookmobile's second stop in the cracked asphalt parking lot of the Pine Hill Market where she works. She turns to another Candy Kitchen resident, Balance Gregory, who's also browsing. "Balance, did you see this?" she asks, holding up "Astrology for Wimps." He laughs. In the background is a steady "click-chunk" as books are checked out. Automation is on the horizon, but for now, everything is handled the old-fashioned way _ taking each patron's library card, then stamping material with a return date. More than 1,000 people are signed up with Rural Bookmobile West, which once a month hits 36 communities, largely in the northwestern part of the state, putting about 2,000 miles on the odometer. Two others _ Rural Bookmobile East and Rural Bookmobile Northeast _ split the rest of the state and cover about the same amount of territory. On this September day, 19 people who visited at Ramah took out 146 books and returned several dozen. Overall, 300 to 350 books were checked out. The ay's first stop was El Morro National Monument, where patrons include rangers and their families. Ranger Richard Bacon said the bookmobile keeps a good selection of mysteries. He picked up his own books and special requests for a colleague who was off when the bookmobile came by. Instead of windows, both sides of the bookmobiles have floor-to-ceiling shelves, tilted higher in front to keep books from sliding out along the road _ although they sometimes fall. "When you pick up two whole shelves full of books, you learn to miss the curbs," Hart said. Roberts gives a tour: CDs on a low step, DVD and VHS movies close to the check-in, check-out counters behind the driver and passenger seats. Racks on a narrow door hold magazines, including Native Peoples, carried because of northwestern New Mexico's large American Indian population. Before leaving each stop, librarians reshelve as many checked-in books as possible for the next patrons, a flurry of bending down to low shelves and hopping on a stool for high ones, shuffling books to stuff more in. "That's when librarians should retire _ when the knees go," Roberts jokes.